One of the most popular wedding and event themes of the day is certainly “bohemian,” “shabby” or “vintage” chic.” It’s also one of our faves for flowers — this theme provides ample choice of flower type and color and lets you get especially creative with your choice of container or accents. 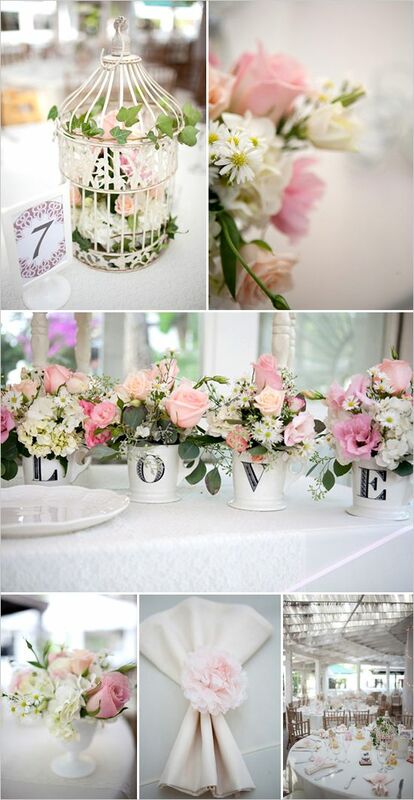 This theme provides a relaxed and very pretty atmosphere at any wedding or event. We’ve gathered some great tips to help you plan. Bohemian chic is suited to a variety of venues but seems especially appropriate for outdoor garden, woodland or rustic settings. The vibe should never be too stuffy or monochromatic and even if not outside, ideally your venue will contain natural element such as greenery, wood, and yes, lots of fresh flowers! The more flowers and greens the better to create a lush and layered “bohemian” look. Boho chic themes work in a variety of colors. You could go very bohemian and use rich jewel tones of all kinds, which cultivates a warm and liberated almost “carnival” atmosphere. Shown left: Rich red calla lilies, orange dahlias, and bright yellow sunflowers combine with the dark blue lanterns and colorful woven table runners to create a visual feast. Shades of pink and white with green or teal accents also work well with a boho theme, and a garden or woodland setting. Think antique dressers, woven hearts, vintage candlesticks, ropes of pearls, and a lush, romantic vibe. Daisies, roses, hydrangeas and peonies would work well. Be sure to order plenty of flowers as they are a key component of any boho event. The more relaxed style of boho chic is perfect for the do-it-yourself type! Get creative and make your own centerpieces. This theme does not call for perfect and precise but let’s you express yourself in without fuss or formality. The photo above shows you a simple DIY suggestion for some fabulous boho table centrepieces. Paint mason jars in various colors to suit your theme. Choose flowers like these beautiful plump dahlias and freesias in rich jewel tones, with sweet accents like the baby’s breath and the craspedia (also called “billy balls”). Mason jars of any kind are perfect for boho themes, and adding special touches like vintage books, antique mirrors, pretty candles, handmade cards. 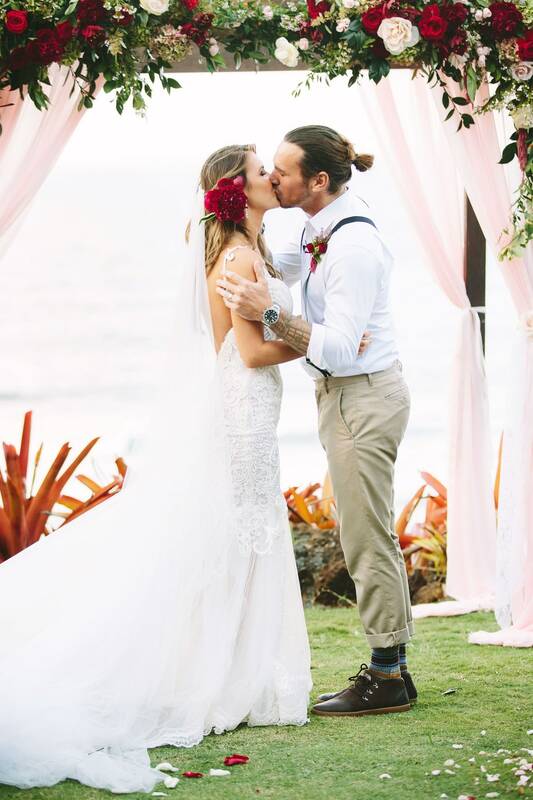 Click to see the full post about this beautiful DIY Boho backyard wedding in California. 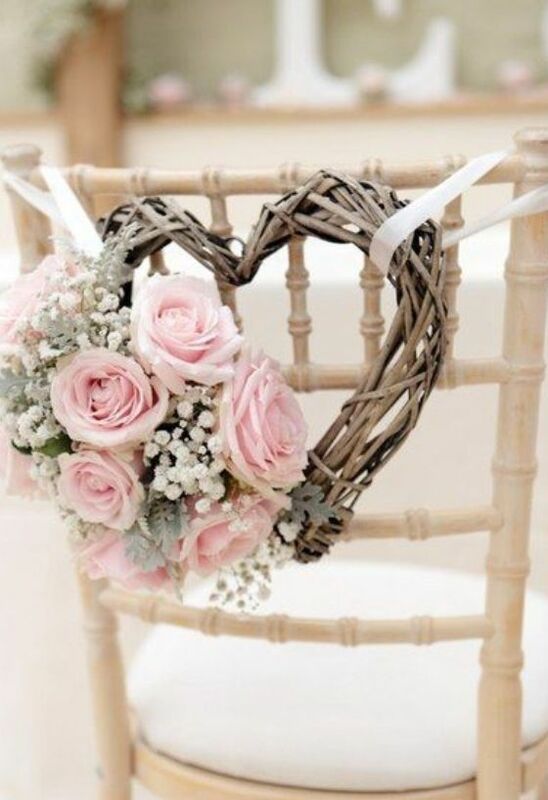 If you are not a DIY type or don’t want the time or the worry to make your own floral arrangements, there are a wide variety of ready-made flowers that would perfectly suit this theme! Try Puppy Love, Love and Sunshine, or I’m All Yours bouquets from BunchesDirect (many more at the website!). Another perfect way to add a boho element to your wedding is to create a beautiful crown of fresh flowers for the bride and bridesmaids.Fresh flowers in your hair creates an instant “goddess” look that is especially suited to this style of event. Click here to find out how to Make your own Floral Crown. Flower Types: Baby’s breath, as we mentioned, is a wonderful and budget-friendly choice for any boho choc event! It works beautifully in centerpieces and when placed in popular boho containers such as wooden crates, drawers or mason jars. Carnations and roses are other flower types that work especially well for boho events. They are pretty without being overly formal or fussy, depending on how you dress them. Accents such as lace, burlap or wood pair especially well with these flowers too. Candles: Adding in candles and fresh greens is another way to enhance your boho theme. Any natural elements will do the trick! 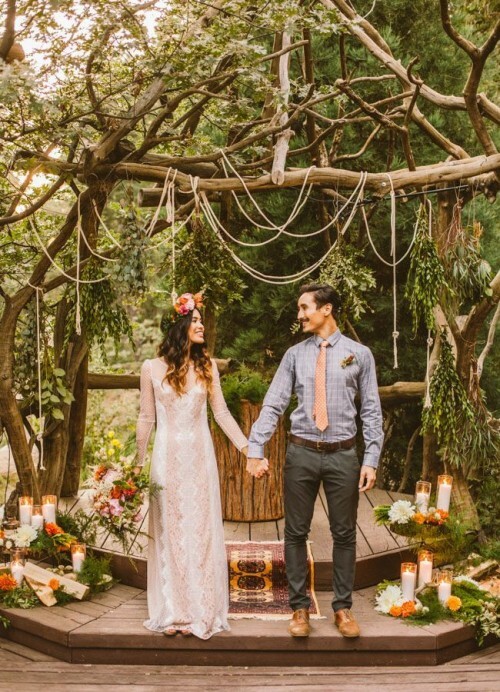 Finally, the best tip: Choose a reputable and experienced floral consultant and they will provide you with perfect guidance in choosing flowers for a boho theme, or any other! Have fun with the planning and let your imagination soar. 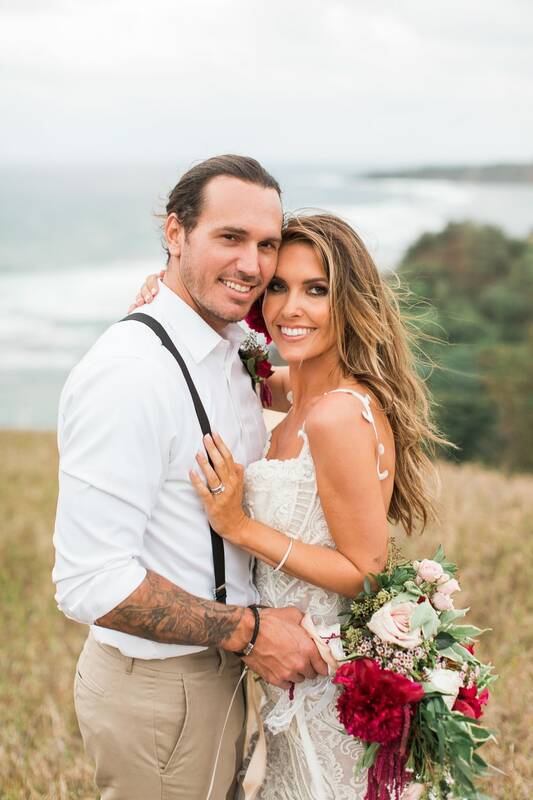 Audrina Patridge and longtime love Corey Bohan may have taken eight years to actually tie the knot, but it was worth the wait! 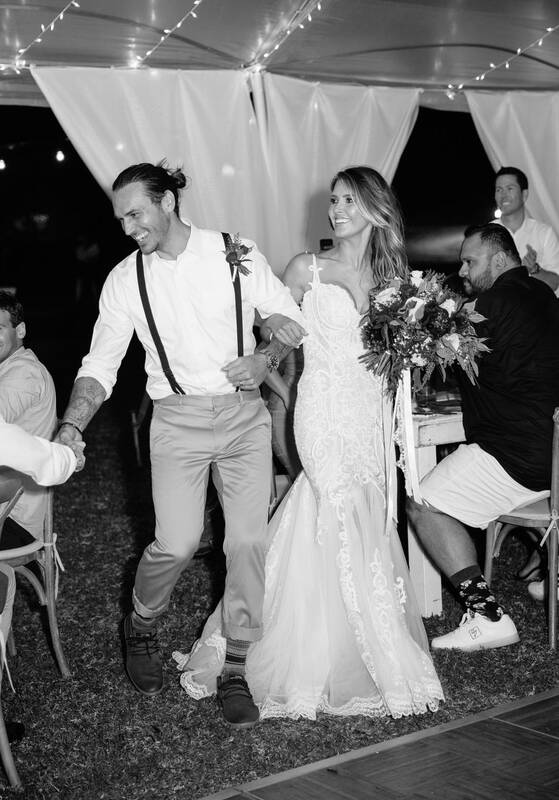 Audrina and BMX bike rider Corey wed in beautiful Hawaii on Saturday, November 5 in an intimate celebration with 100 close friends and family. 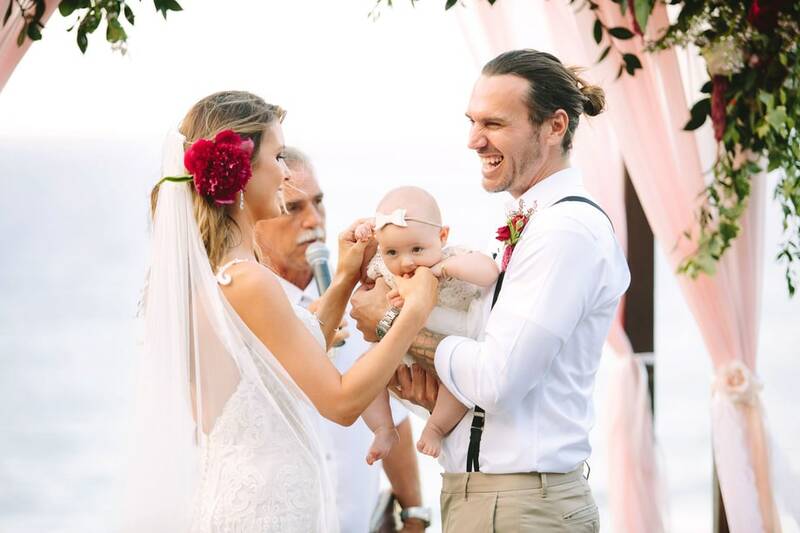 Their fourth-month old daughter Kirra was also part of the special day! The bridal bouquets were gorgeous! Created by Steven Boyle Designs, they worked perfectly with the “bohemian” vibe as well as the glorious Hawaiian wedding location. They were a lush, artful mix with a “freshly gathered” feel that kept them from being too fussy or formal, while still providing plenty of romance with their rich color scheme. ff you love Audrina’s wedding flowers, check out bulk red roses, seeded eucalyptus, pink garden roses and pink ranunculus from BunchesDirect. You could also choose beautiful ready-made bridal bouquets such as Forever Connecting, Wild Beauty or Crimson Dream. Many more romantic and “bohemian” bouquets available at the website. 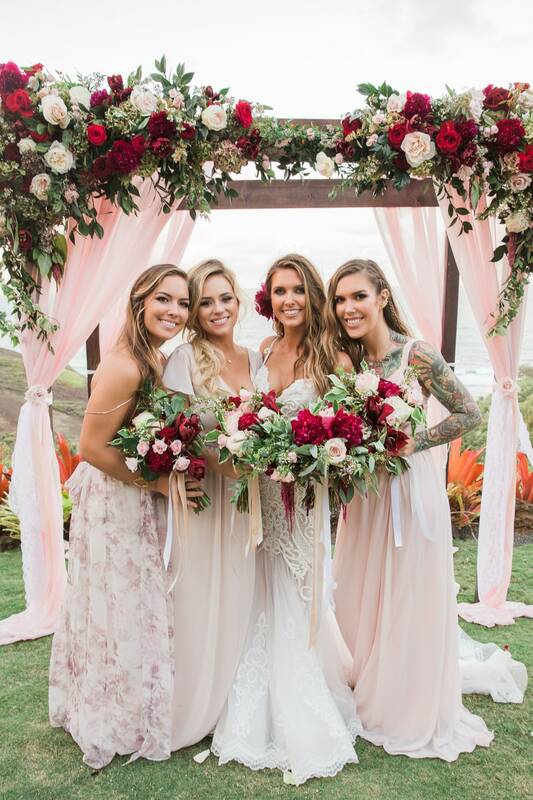 We wish Audrina, Corey and Kirra many more years of happiness! We’ve all heard of “landscape” as in “all the visible features of an area of countryside or land, often considered in terms of their aesthetic appeal” (yes, we broke out the dictionary for this!). We all recall the powerful impact of standing at a particular site and taking survey of a gorgeous vista. When you are decorating your wedding or event, don’t overlook the importance of one of the key elements of your venue: your tables, and the view that your guests will have of them. The visible appeal you create with this “tablescape,” both from close up, when guests are seated, and from farther back, when guests first enter the room, can provide you with massive visual appeal at your event. 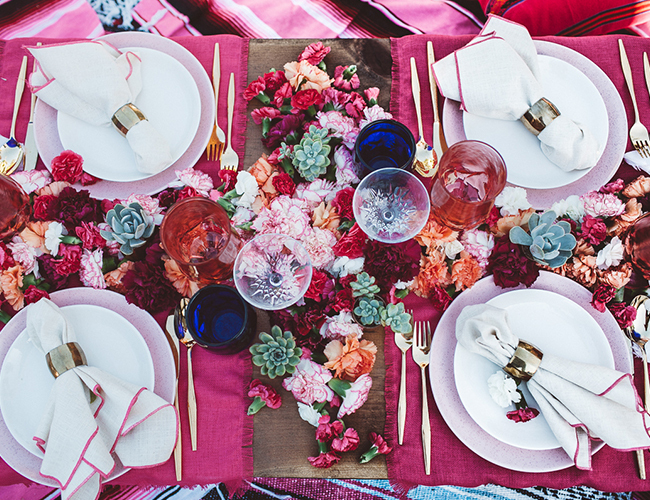 There are a few key elements to remember when creating your own tablescape. Flowers are always a key element so don’t forget to order enough to create your vision. Read on to ensure your success! It’s important to vary the heights of your items. 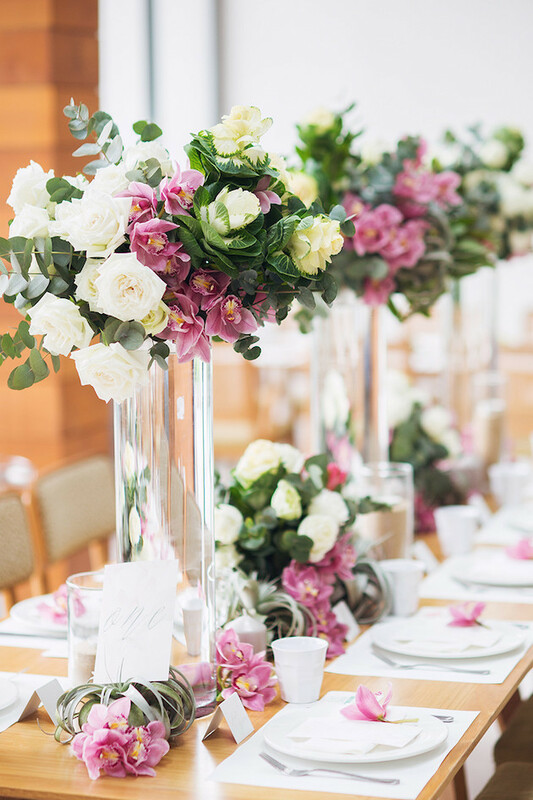 Include some tall elements such as candlesticks, lanterns or big vases, and also some lower elements such as votives, mirrors, small bud vases, or pretty napkin rings. 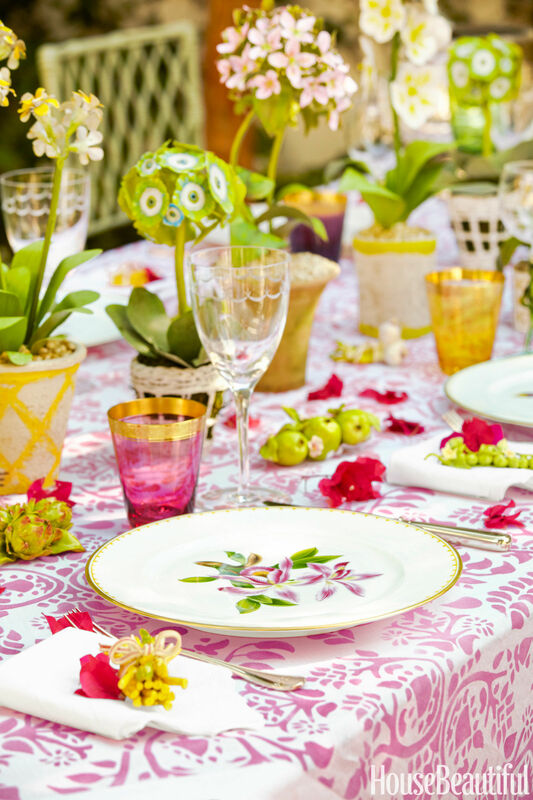 Choosing textiles, dishes and glassware in varied patterns, colors and textures is another surefire way to add lots of visual impact and interest to any tablescape. Don’t be afraid to mix and match so long as one aspect, such as a key color, is consistent. Don’t be shy when setting up a tablescape. Adding in lots of interesting or unexpected elements will result in more visual appeal, and will also stimulate conversation between your guests. 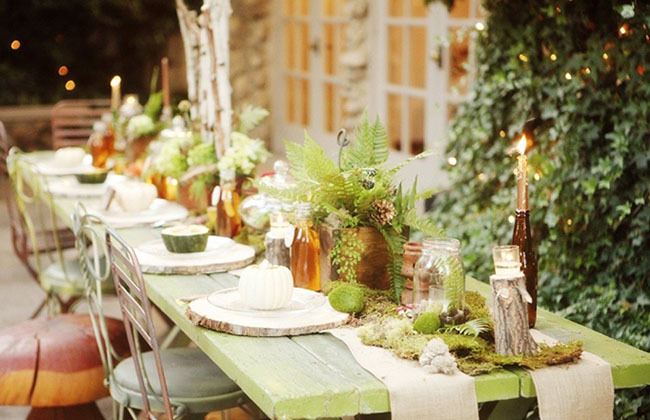 This woodland tablescape (above) has a lot of unique elements including fruit, wooden stumps with glass votives, taller candlesticks, wooden place settings, miss, bark and many other interesting touches. Don’t overlook the ceiling above the table, or the space surrounding it. Some key decor elements can be layered in to create even more impact over the most “important” tables such as the head table at a wedding, or the buffet table at the event. 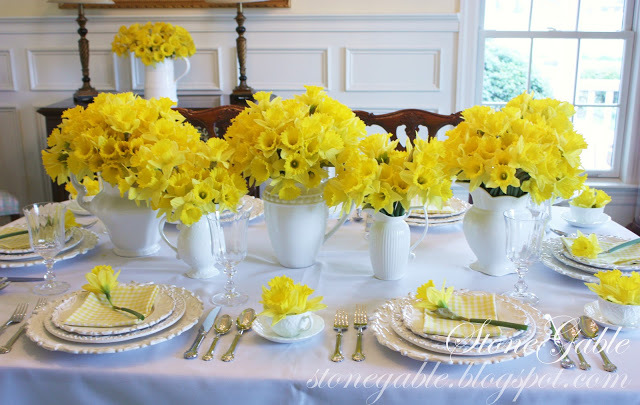 An easier way to create a tablescape with a ton of impact is to buy an assortment of fresh and beautiful bulk flowers. Simply arrange a generous array of blooms around your place settings for instant visual appeal. Choose vivid colors and high contrast with textiles for even more impact! If you are not as into high contrast, sticking with all one color for your floral accents is another relatively easy way to create a successful tablescape. In the photo above, dishes and linens were kept white, and all flowers yellow. Again, vary the heights of your accent pieces for more visual interest, as was done with these tall and medium-sized pitchers as vases, flowers in the low teacups, plus the loose flowers resting on each place. We said it before, but we will say it again– don’t overlook the impact of fresh flowers! Flowers will provide instant color, texture, freshness and beauty to anchor any tablescape. Don’t be afraid to order plenty; if you choose a reputable online vendor you can achieve gorgeous results at a low price.